If you want to walk the paths where the Greek Gods once roamed amid beaches mentioned in Homer’s Ulysses and destinations extolled in Corelli’s Mandolin, the richly layered lush island of Zakynthos is the right place. 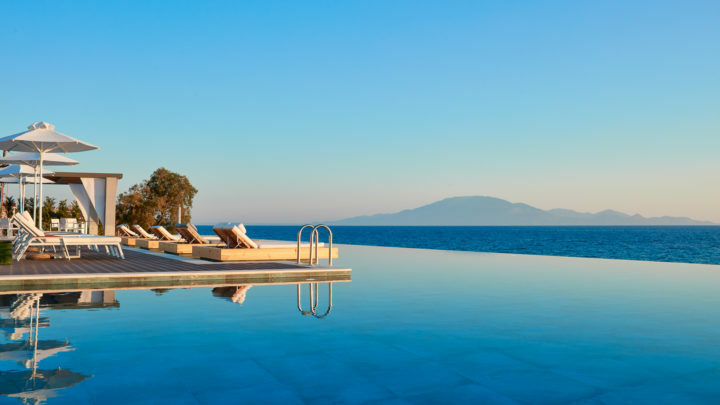 An exquisite stay at Lesante Blu awaits for those looking to island hop and discover Greek isles that are under the radar and afford mesmerizing views of the crystalline Ionian Sea. Zakynthos is the southernmost yet third largest in both in size and population of the Greek Ionian islands. It is located 8.5 miles south of Kefallonia, 9.5 miles west of the Peloponnese islands and approximately 186 miles west of Athens. Guests can arrive in style to Lesante Blu by yacht from a private dock or helicopter where there is a private helipad on site. Zante is 4 miles away while the Zakynthos International Airport (ZTH). 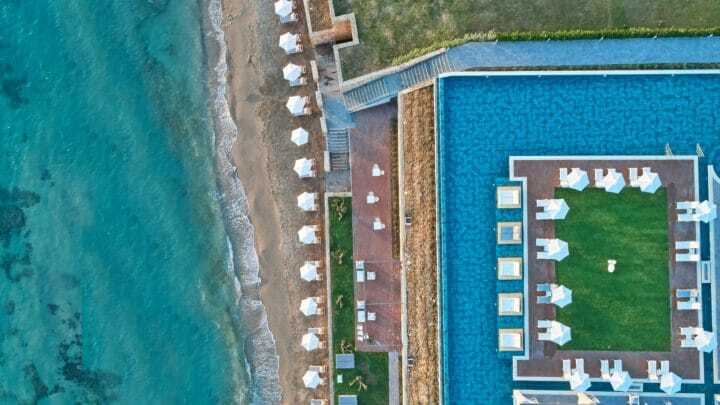 On the island’s east coast, Lesante Blu, member of Leading Hotels of the World, it brings a sheen of five-star luxury to the casual, laid-back Greek isle. 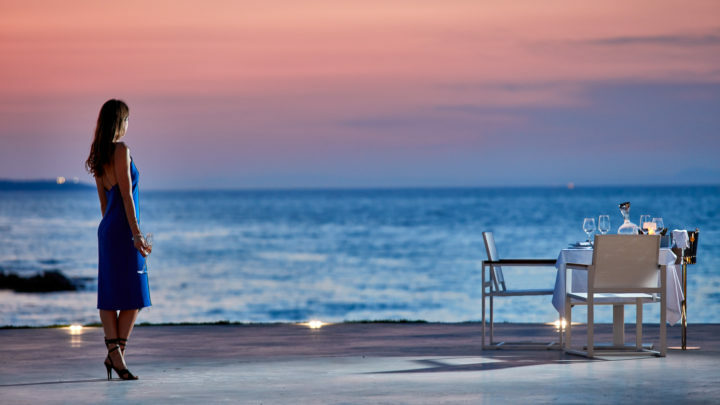 Boasting 92 suites all offering stunning views of the sea, the resort is ideal for sun-worshippers, honeymooners or couples celebrating an anniversary or seeking a quiet romantic getaway. It maintains an adults-only policy that keeps noise and stirring distractions at bay. Stays are ideal from May-October. The all-suite accommodations afford privacy and direct sea views with sleek and contemporary design. A Bed and Breakfast option is available for all accommodations plus a dedicated Concierge Service with additional amenities such as private Jacuzzis and pools, private terraces and Nespresso coffee makers. In the summer, the island is graced with eternal sunshine and warm weather with a cooling sea breeze. There are many activities and ways to idle away the days far from crowds and daily routines. Activities are endless with days beginning with morning yoga, tennis, horseback riding, private yacht excursions, water sports, water skiing and jet skiing, diving, sailing and guided hiking, biking and village tours. For those seek to explore the island, car and bike rentals are available. Many of the property’s activities are complimentary. For those seeking relaxation, lounge around the infinity pool that overlooks the dazzling white rocks leading to the azure sea. Lesante Blu’s Spa offers a variety of specialty facials, massages and body scrubs by Germaine de capuccini, such as a golden nectar and yellow seaweed body wrap. There is a sauna, hammam, and indoor heated swimming pool. Lesante Blu boasts three restaurants and three bars on property with serene sea views and private dining options. Executive Chef Nikos Ispiroudis draws from his Greek roots and created menus that features the fresh seafood from the Ionian Sea, local meats and vegetables and products (particularly olive oil, honey and raisons) where guests can savor traditional Greek and Mediterranean cuisine to creative Greek gastronomy and fine-dining at Melia. At Ostria, guests can sample all day an à la carte menu featuring Mediterranean and Greek cuisine. Begin the day at Gaia which serves American breakfast and buffet-style dinner while in the afternoon or sunset guests can cool off or savor refreshing drinks at its varied of bars from the Almyra Beach Bar to Ostria Pool Bar. At dusk, the Panorama Champagne Bar is the perfect place to take in the brilliant sunset. There are a variety of packages mix and match inclusions depending on the needs of the guests. 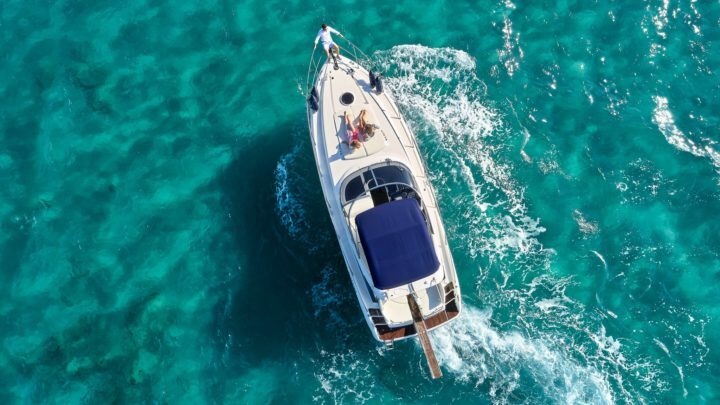 A Dine Around package highlights the resort’s Mediterranean flavors, while the Romance package includes a three-hour islands cruise, a complimentary massage and a candlelight dinner along with private limo transfers to and from the airport. While leaving the property may be difficult, there is much about the myth and magic of Zakynthos that will lure them from their comforts to explore the island. The island was mentioned in Homer’s works for its involvement in the Trojan War. The island’s legacy of civilizations can be counted back to the late Bronze Age. The nobles from Zakynthos were among Penelope’s suitors. It was said that the twins Artemis and Apollo, goddess of hunting and god of light, favored the island and roamed its thick pine forests and 76 miles of dramatic coastline. In more recent ages, the Venetians adopted the island as an outpost and lived peacefully with the local populations for more than 300 years. Leaving their precious castles and architecture behind. It is still possible to experience this era in Zakynthos Town or Zante with its walking streets of neoclassical arched arcades, churches and clock towers. The Byzantine Museum there presents a plethora of frescoes, sculptures, and religious icons, many dating from the 12th century. Visitors can tour the ruins of the nearby Venetian castle that was largely destroyed by invading Turks in 1480. Well-preserved are the vaulted stone prison, the arsenal, and the main bastion of the fortress bearing fascinating caves and hidden chambers. 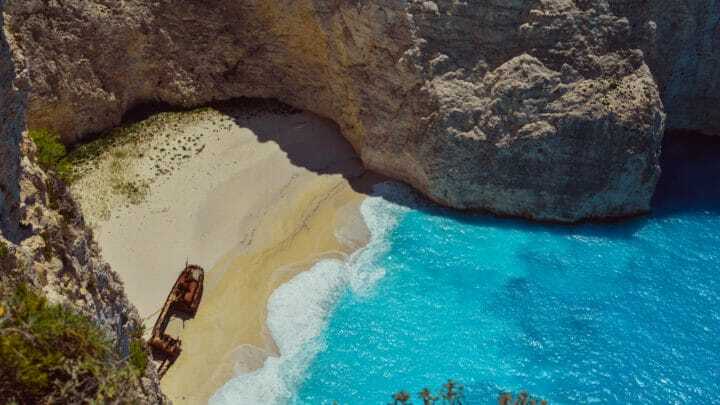 While Zakynthos has earned notice as a party island in recent years, there are many quiet and empty beaches to explore along the rugged cliff coast. 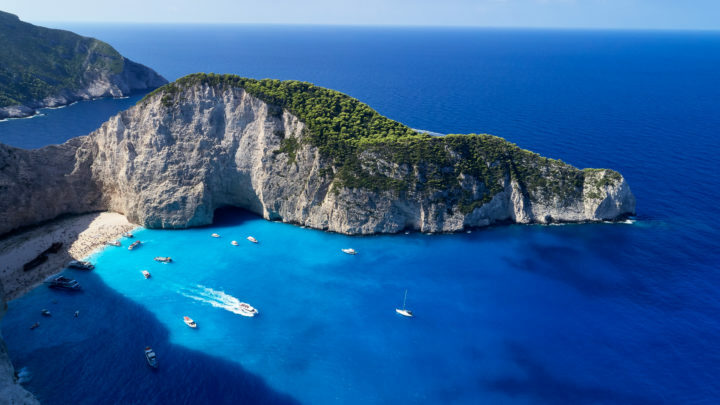 One of them is Navagio Beach, also known as Smuggler’s Cove or Shipwreck Beach. While it is impossible to walk to this beach given its seclusion by cliffs more than 650 feet high, many local boats can access this magical place that is perfect for swimming, snorkeling or point for afternoon sails. Spotting the Loggerhead Sea Turtles are not to be missed. 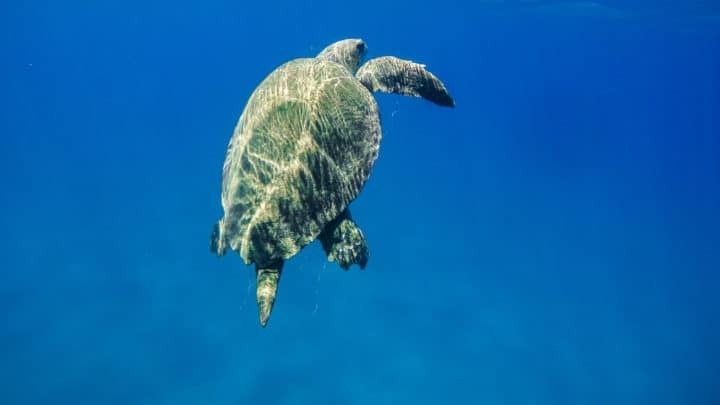 These endangered turtles return to the reefs and beaches, such as Lagana, to nest. The well-connected Concierge at Lesante Blu can match guests with the right beaches according to interests and wants. Fly to Zakynthos International Airport (ZTH) located on the island’s southern tip near the town of Kalamaki for the most direct access to the island. There are direct flights from major European cities and daily flights operated by British Airways from Heathrow plus two daily flights to Athens operated by Olympic Air and Sky Express. It is a 15-minute drive from the resort. Numerous flights from major European cities are available during the high season so travelers can fly directly without connecting in Athens. Yachts can dock at Marina Port in Zakynthos which offers convenient harbor services not far from the airport.